Dry nose can cause lot of discomfort and if you do not take care to tackle this problem, it can lead to other health problems. Dry nose can lead to sinus problems as well as headaches. In severe cases, it can cause trouble in breathing and as well as vision problems. 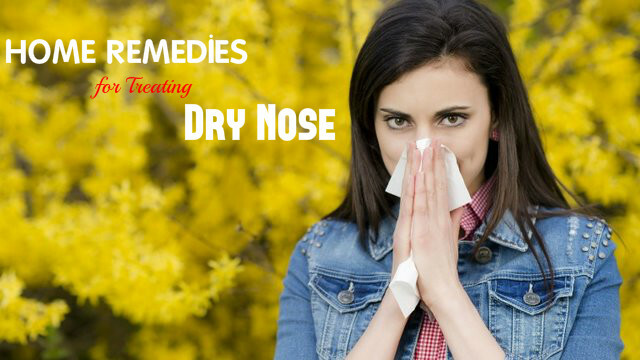 There are home remedies to treat dry nose. Dry Nose – What is it? You experience dry nose when the internal nasal passages turn dry. Crusting of inner nose mucosa is also a result of dry nose. For this you need virgin coconut oil. All you have to do is to pour a drop or two of this oil in each nostril. Use this once every day to get rid of dry nose. Coconut oil is known for its immense benefits for the skin, hair and health. Applying coconut oil in the nostrils prevents your nostrils from getting dry and also reduces the pain as it fills the gap between the dry cells. However, make sure that you do not overdo it. When the there is dryness in the environment, the condition of dry nose can get worse. It can also lead to congestion of the nose. So, it is important that you maintain the humidity in the room in which you spend most of your day, especially during dry and cold climates. Humidifiers help in adding moisture to the surroundings and provide you relief from the symptoms of dry nose like irritation in the nose and dryness. If you do not have humidifiers at home, keep a bucket of water near heating systems. This will help in maintaining the humidity in the room. You need virgin olive oil and a dropper for this treatment. Pour a few drops of olive oil into your nostrils with the help of the dropper. You can repeat this twice a day. Olive oil is also good for the skin and helps in keeping the skin inside the nasal passages hydrated. This prevents drying of the nose and provides you relief from irritation and swelling. Mix the salt with water and then pour the solution into the spray bottle. Now you have to bend your head towards the floor and spritz salt water a few times into your nasal cavities. You may also take some of the solution in your palm and inhale it. Make sure that it reaches as far as possible in the sinus cavities. After 10 seconds you can blow the water out. Use saline water in this way three to four times a day. Saline water acts as a humidifier helps in keeping your nasal cavities well hydrated. You should not use table salt as it can contain some additives that can cause irritation to your nose. Sauna bath is loved by all. If you can afford a sauna bath, it is the best way to treat your dry nose. It also gets you relief from sore body. If you cannot afford it, then you can just heat a bath and add a few drops of aroma oil to the hot bath. Soak in it for a few minutes. Remember not to stay in the bath for a long time as it can lead to leaky nose. You need organic sesame oil and a dropper for this. Take the oil in the dropper and tilt your head backwards. Pour a drop of the oil in each nostril and then inhale deeply so that it reaches the internal nasal passages and keeps your nostrils hydrated. Repeat this treatment twice daily. Sesame oil contains more vitamin E oil in it than any other oil. It is great for keeping your skin well moisturized. Studies have shown that sesame oil is much better than saline water for treating dry nose. Heat water and pour the hot water into the bowl. Now take the towel and cover your head with it, so that no steam escapes into the air. Inhale the steam from the bowl for about 10 minutes. After steaming, blow your nose gently. You can inhale steam in this way for two four times a day. Steaming is the easiest way to get relief from dry nose. So, steam at regular intervals to treat dry nose. This remedy is very soothing and helps in softening the dried mucus present in the nasal passages. For this treatment you need Vitamin E capsules. Just pierce the capsule and pour two to three drops of the oil into your nostrils by tilting your head upwards. You can repeat it twice a day. Vitamin E is very effective for the skin. It helps in keeping the nasal cavities hydrated and provides you relief from dryness. It is also great for healing the nasal cavities because of its anti-inflammatory and anti-oxidant properties. One thing that most people do for getting relief from dry nose is applying petroleum jelly. But this treatment is not recommended by the doctors. It is aid that by applying petroleum jelly internally in the nose, you may suffer from a type of pneumonia. So, it is advisable that you stay away from petroleum jelly when you treat dry nose. What to eat and avoid for dry nose relief ? Drink lots of fluids. Try to have at least 8 to 10 glasses of water daily. Have hot and spicy foods, like soups. This can get you relief from dry nose. Try to reduce the intake of caffeine, alcohol and salt as they are dehydrating agents. Try not to take any medications that can lead to drying of the nostrils. If you need to take such medications, try t keep your body well hydrated.